Yesterday's skiing at the Wilmington office of the Prudential Terry Horrocks Real Estate Agency, where I am an agent, deserves to be noted. Although I nearly canceled my appearance at Telemark Tuesday due to the gray clouds and fog at my house, I decided to give it a try since I could always leave if conditions were dreadful. Turns out, it was a beautiful day to be at Whiteface. 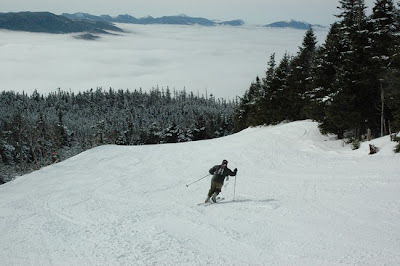 As you can see in today's featured photo, there was an inversion factor going on that allowed the very tippy top of big Whiteface to jut out of the clouds and fog. So, from the top, it was sunny and blue and I could see as far away as the Green Mts. in Vermont. The layer of cloudy fog looked surreal and the smell of spring hit me in the face about mid-way up the chair lift to the top. In addition, the snow conditions were excellent, especially for tele skiing. The trails had about 5 inches of fresh snow, which hid a packed base of corn snow underneath. It was great fun skiing even when the trails got a little bumped up since the moguls were nice and soft for jumping off, and you could still carve a turn around them. That's one of the nice parts of this Adirondack lifestyle; you can get some work done early in the morning, get in a couple of hours of world-class skiing, and still get back to the office in time for more work!